Lands End, gentle ocean waves, palm trees, a sandy beach, and a glowing sunset. 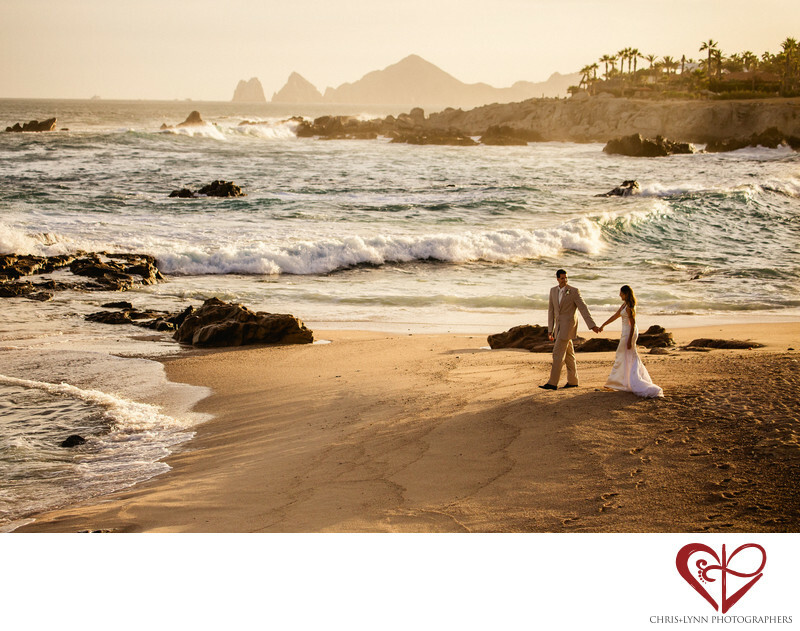 This image of a bride and groom walking along the Sea of Cortes after their wedding includes all the essential features couples dream of when they plan their Mexico destination wedding! No wonder Esperanza is one of the most popular wedding locations in Los Cabos. It is also one of our favorites for photography. This beautiful private beach is always changing and has so many different elements, we could never get bored of shooting there; we can always create something different. Within the easily walkable beach, there are dark dramatic rock formations, towering cliffs, smooth stretches of soft sand, jagged outcrops of rocks that can form little islands depending on the tide, and views of palm trees - such variety of natural beauty! As a wedding photographer, having all these options combined with the constantly changing conditions of the ocean waves and sunshine, allows us to be continually creative in this location. This image, showcasing the nature of the area, was taken just after the sun had set behind the cliffs, making the beach glow with warm tones of orange and pink. The couple worked with us on their timeline for their Cabo wedding to ensure they would have time to do photos during "magic hour" when the light is soft and most flattering. We highly recommend taking the time to do portraits at sunset instead of rushing to the reception; you'll never regret enjoying that once-in-a-lifetime moment together as husband and wife. 1/4000; f/4.0; ISO 800; 86.0 mm.